Although there are so many video formats which are compatible with one or more operating systems, it is important to take advantage of the video converter programs to convert the video files to most compatible file format for playback. KeepVid Video Converter is one of the best video converters that can convert videos from all kinds of devices. It allows you to download video and convert it easily in the desired format of your choice. You can convert MP4 to MOV with just one click using this program. KeepVid Video Converter allows the users to convert MP4 to MOV in a very easy and convenient way. You can download online MP4 videos as well with this program and then convert them in MOV format. If you want to convert local video that is also possible and you can convert your videos in mostly all formats with few clicks only. This software allows convert videos in original quality. It supports more than 1000 of video/audio formats for any device you want. This video converter enables you to convert multiple videos with one click. Step 1: Start KeepVid Video Converter and add MP4 video from your computer. Step 2: Choose MOV as an output format and click the Convert button. Step 3: When the conversion finishes, click Converted tab to find your converted video. 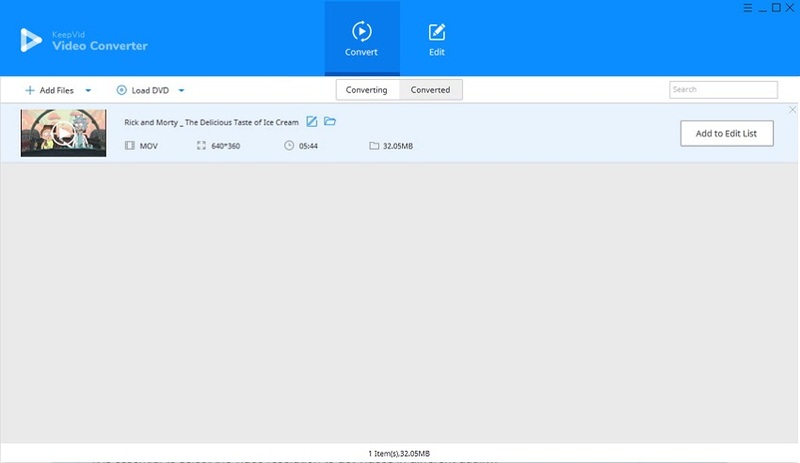 Firstly, download the installation package of KeepVid Video Converter on your computer and then launch KeepVid Video Converter after successful installation. 2Now click the Add Files/Add Folder button at the upper left corner to add MP4 videos from your computer. 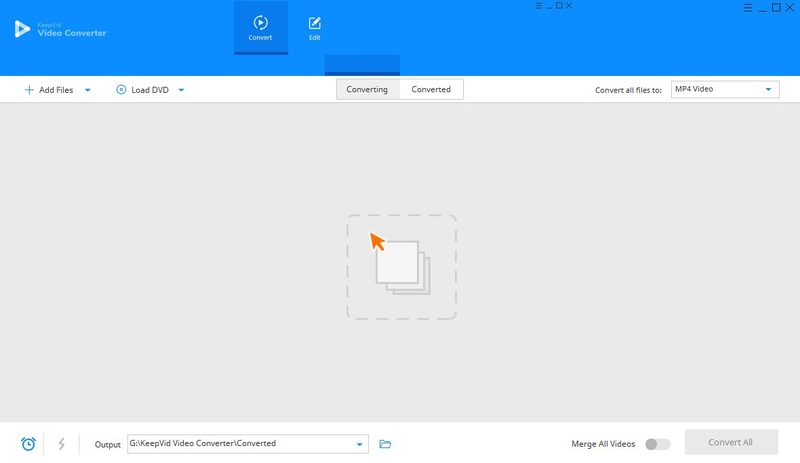 You can also directly drag and drop videos from your desktop into KeepVid Video Converter. 3Once you have added the files to convert, you can click the inverted triangle icon at the right side of the Target area or click the inverted triangle beside the Convert all files to button, and select MOV as an output format. After that, click Convert or Convert All button to start converting MP4 video to MOV video. 4When the conversion finishes, you can navigate to Converted tab and find your converted video. You’re also able to find the converted video in your computer by right-clicking the converted video and choosing Open File Location. As introduced, KeepVid Video Converter can help you to convert videos to more than 1,000 video and audio formats, so if you're going to convert MOV to MP4, you can also finish KeepVid Video Converter. • You’re enabled to select multiple video files to convert in one time. • It is essential to select the video resolution to get videos in different quality. • You can have a free trial of KeepVid Video Converter before purchasing it. • If you want to edit videos, you can either choose Edit section or the edit buttons in Convert section. In this part, we're going to introduce you the top MP4 to MOV online and desktop video converters. It is a great online video converter website which is developed by KeepVid Studio. No software installation is needed to convert MP4 to MOV online with this converter as the software works online for free. 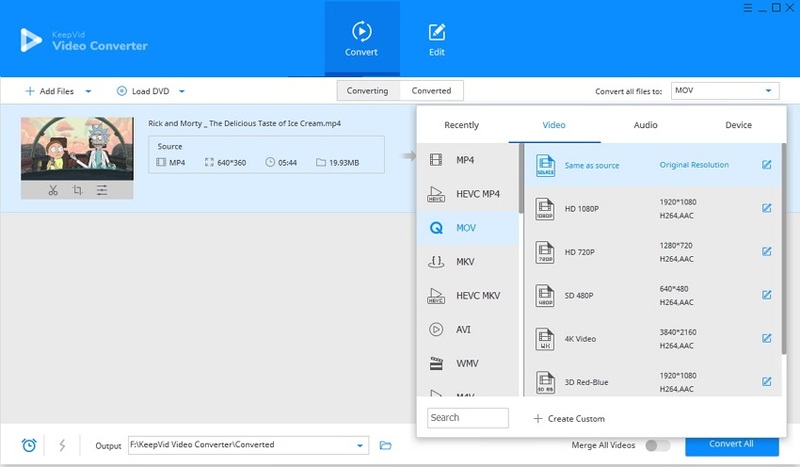 You only need to select the MP4 files from your desktop and choose MOV as an output format, then click the “Convert Now” option to start converting MP4 to MOV files. When the conversion finishes, you’ll get notification of downloading the converted video. This software is capable of converting videos from one format into another including converting MP4 files into MOV files. This video converter also gives the benefit of trimming and editing videos. It is compatible with both Windows and Mac operating systems. Convert MP4 to MOV online to play videos on Apple QuickTime by using this web converter online application is easy and fast. This video converter website provides the attractive user interface and it is very easy to use. This website even allows the users to access the files from cloud storage. This online converter also provides document conversion. KeepVid Video Converter is the best software to convert MP4 to MOV. It offers lots of choices and options for you to convert and edit your favorite videos. You can also use the KeepVid Online Video Converter to convert videos with easy steps. KeepVid Video Converter is a fully-featured solution for video conversion and allows you to convert, edit and download videos.